What Kind Of Rye Bread Am I Thinking About? Last month I had a sandwich handed to me from someone I can no longer ask what kind of rye bread it was (employee I fired - he is Polish if that helps), and I am hoping you all can direct me to the right recipe and name. The rye was light to medium brown, it was thinly sliced - very thin. It was the type that had a dense, and hearty quality. Not pumpernickel (at least I don't think it was - are there lightly coloured pumpernickels?? - no, no it was rye. It HAD to be rye). The texture was dense and more on the dry side, and not because it was stale, it was fresh. The below photo is the closest I can find to describe it. Looks like what we used to call a 'deli' rye. Light rye flour (30% -40%) with bread flour. Does it have any spices in it? Closest recipe I know of would be in Stan's book Inside the Jewish Bakery. He has deli ryes but they have caraway seeds in them which can be left out if the bread you are talking about didn't include them. I agree with Janet, John. 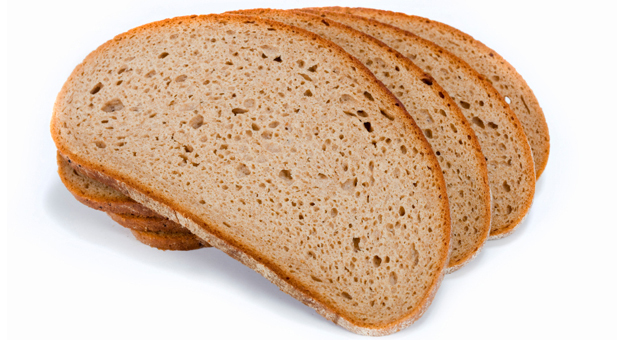 The photo does look like a "deli rye," also known as a Jewish Sour Rye. As Janet said, this usually has caraway seeds, but it doesn't have to. Sometimes it's made with diced, sautéed onions in the dough. If you think the bread might have been a Polish rye, Daniel Leader's Local Breads has 3 formulas for different versions, all of which are very good. However, the photo really does look like "deli rye." Close Juergen! This one in the photo looks a little bit on the softer side. The one I had was cut VERY thin and still stayed straight flat as a board. and the crumb is a bit difficult to judge just from photos. I thought of the Berliner Landbrot immediately when IU saw your picture - the airy crumb with fairly thick walls is typical. The color can be surprisingly light, depending on the rye flour used. At 70% rye this bread is airy yet firm, and well supports very thin slices. You are entering a huge field for experimentation. Enjoy! PS. : There are some documents available, specifically about Berliner Landbrot. The first one is very interesting because it investigates the performance of hand-mixed versus machine-mixed sourdough and gives lots of insights into several German standard processes to make rye/wheat mixed breads. 100% rye can easily be this light. Thanks guys. I will try out both a deli rye and polish rye. This particular one did not have spices such as onion or caraway. Also, a key quality I liked about this particular type of rye was that it was stiff. So if you held a piece between your finger tips at one end of the slice by the crust, the other end would stay in the same line and not flop. That's how rigid it was, or dense. Either way, it was one of the best sandwiches I have had in a while with rye, and it's not because of the filling. I NEED this bread. If no spices in it then you will just have to experiment :-) Start out with a certain percentage of rye and increase until you hit the flavor profile but then there is the texture which comes from different flours - bread vs all purpose etc....a large experimental ground. Just remember to use a rye sour as leavening. ITJB has an easy rye sour build that goes with the Jewish Deli Rye. I have adapted it to most of my rye breads because it is sooo nice. Bite the bullet, contact the guy you fired. Tell him. "It was just business, but bread is the staff of life". Or simply accept it as downside of downsizing. I found Chilean Rye today! Now to get my starter up! It does have some flakes in it and is a tan colored flour. Happy Camper here! I'm so excited I could bake! Come on John, I'll race ya to that loaf! Got yourself a rye starter? I'm a bit worried as I hear the dough can be a bit challenging to work with. Considering that I don't have a dough mixer, I am up for a challenge I think with rye dough. Either way, I think you would win hands down anyway! I am all for rushing. :-) The sooner you get started the sooner you get over the hesitation and discover the wonders of rye. People I give rye loaves to LOVE them since good fresh rye loaves are not nearly as common as wheat loaves around here. Sorry, I get excited about rye breads - especially this time of year. Something about rye and cooler weather. Thanks Janet! Well if you are such a rye enthusiast, I will be looking to you for help if needed. The reason I thought rye bread would be a challenge is from the few recipes I read so far calling for long mixing/kneading in a stand mixer. First off, I don't own one, so I thought kneading will be a nightmare due to the stickiness. If there is no kneading involved then I should be ok. SHOULD. Yes, I am a rye enthusiast but still learning lots. I am happy to help all I can but I know very little compared to the few here I look to when working with rye doughs. These are the bakers that I have learned from and you might check out their blogs as all have detailed rye bread formulas on them...... Juergen, Hanseata, Hansjoakim, MiniOven and Andy (ananda). In my opinion, THEY really know what they are doing. I am happy to help with what I do know though which is mostly don't be afraid and find a method of building a rye sour that fits into your schedule and you will be set. Also figure out if you like using a soaker/scald or simply kneading in the flour. I tried different recipes to get the feel for each and now have a 'go to' build I like and I use soakers or scalds depending on the recipe at hand. I look forward to hearing about your experiments. Don't fear it, it is very rewarding. Just keep in mind that rye is different from wheat. That's all. Long mixing times for high% rye doughs can be used to aid hydration (the German term is Quellknetung). This is mostly used in breads with high percentage of coarse rye meal. You can use soakers / scalds as an altenative. I don't knead my 100% Russian rye, and I don't use scalds etc. Works very well for the time I invest. (for 6 loaves: 10 minutes mise-en-place, 5min mix, 5min shaping, 15 min cleanup). I usually handle doughs with a rye content between 60% and 99% in a similar way. I use a plastic spatula to mix. When you handle the dough with your hands just keep them wet. Do you have a rye starter going? If not, there are a number of yeasted rye recipes out there - if you want to explore the handling of rye. I would recommend the Pane Nero Di Bolzano from Carol Field's Italian Baker. Quite a bit more dense than the bread you desire, but it gives you an idea about rye handling, and it is tasty. Send me a private message if you want more details.